Preheat an oven to 425 degrees F (220 degrees C). 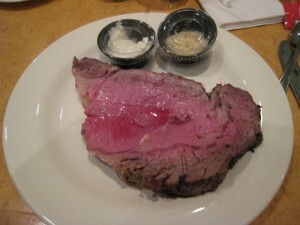 Place prime rib into a roasting pan, and rub Worcestershire sauce all over the outside. Evenly sprinkle black pepper, salt, onion powder and garlic powder. Roast, uncovered, in the preheated oven for 2 ½ hours. Remove from the oven, cover with aluminum foil, and allow to rest in a warm spot for 30 minutes before slicing. While the roast is resting, scrape the drippings from the roasting pan into a skillet. Place the skillet over medium heat, and stir in the orange juice and flour. Cook and stir until juice began to thicken and flour is mixed in well (about 15 to 20 minutes). Serve alongside the sliced prime rib as an au jus or gravy. This flavorful prime rib would be most tasteful with rice pilaf and broccoli with a tangy cheese sauce. To further capture your pallets attention, serve with a nice red Chardonnay wine. A candlelight setting would make this an evening of bliss. Enjoy!